But what separates the aforementioned from this particular mish-mash is a sense of humour. Alan Moore clearly had a blast writing League of Extraordinary Gentlemen, and his wit just about holds the entire thing together. Bill Willingham’s early Fables work also did a superb job of juxtaposing comedy with tragedy. Conor McCreery and Anthony Del Col make the mistake of taking Kill Shakespeare too seriously. 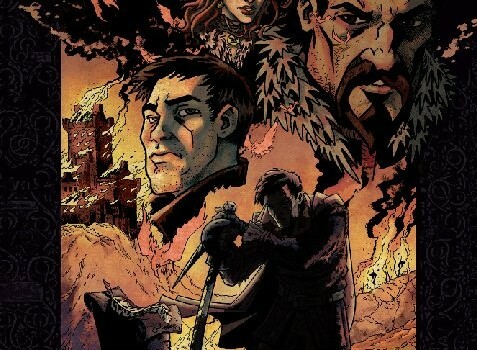 Not that this series should be played for laughs, but there’s absolutely no magic when Hamlet meets Richard III. They also clearly lack the appreciation for Shakespeare’s material that Moore displayed even for as unfashionable an icon as Allan Quatermain. 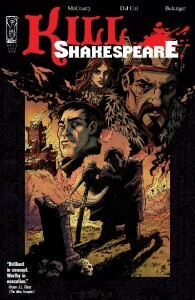 Hamlet is the protagonist here, banished from Denmark by King Claudius after a “mistaken attempt to revenge his father.” After his ship falls to pirates, Hamlet finds himself washed up on English shores, where an accommodating King Richard the Third (aided by the three witches) asks him to help free the realm of a tyrannical wizard named William Shakespeare. How? By stealing Shakespeare’s quill. As you might expect, there are allusions aplenty in Kill Shakespeare, though at times the script feels like it’s simply name-checking minor characters. There’s no sense of cohesion to the world McCreery and Del Col have created, and none of the characters feel like their original counterparts. Hamlet is a stock fantasy hero, while Rosencrantz and Guildenstern are recognisable in name only. Andy Belanger’s art is good though, particularly during an inspired dream sequence at sea. I admittedly have a hard time understanding the appeal behind these sort of amalgamations, as well as literary perversions such as Pride and Prejudice and Zombies. Most comic collectors will have some level of appreciation for Shakespeare – though society would rather brand us comic geeks as semi-illiterate – but they presumably enjoy the plays for different reasons than they enjoy comics. There seems to be this assumption within the storytelling industries that combining or updating classic works of fiction is going to produce a sure-fire hit, but I do wonder whether these titles will continue to sell once the novelty has worn off. I love chocolate, sushi and pizza, but that doesn’t mean I ever want to eat all three at once.